In the 21st century, we marvel at the wonders of the new technologies that have made our life easier and more enjoyable. In home electronics and home theater these days, "digital" rules. From the humble beginnings of the transistor we now have everything from microprocessors to such digital products as the CD, SACD, DVD/Blu-ray, DVRs, HD and Ultra HD TVs, media streamers, and of course, we can't overlook the extremely popular portable music playback devices, such as iPods, Android, and iPhones. But many of us still remember the analog world of the vacuum tube, the trusted workhorse that started the whole home electronics boom in the first place. 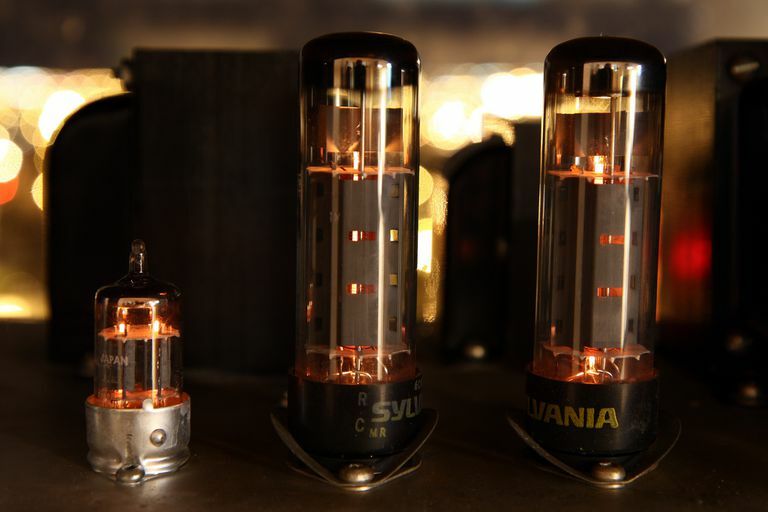 Not only is the vacuum tube still with us but as a side benefit of the fall of Eastern Europe and the Soviet Union towards the end of the 20 century, the traditional vacuum tube is becoming a more common sight in Western high-end audio products. With U.S. and Asian companies firmly entrenched in the production of digital solid state devices, countries that had previously been behind the digital curve such as Russia, Eastern Europe, and even China still have large tube manufacturing facilities and thus, have been producing and exporting vacuum tubes to the West more freely in the last decade or so. As a result, the high-end audio market has tapped into this phenomenon like gangbusters. Many true audiophiles have never been completely satisfied with the cold, sterile sound quality and performance of transistors and integrated circuits. As a result, a niche market has opened up for vacuum tube audio equipment. Manufacturers, such as Audio Research, Cary Audio, ECP Audio, Glow Audio, Granite Audio, Jolida, Manley Labs, McIntosh, Rogue Audio, and others are also quenching the thirst for vacuum tube products with their lineup of home audio equipment. In fact, if you still own an iPod, you may still be able to find a used vacuum tube iPod/iPhone dock/amplifier on Amazon or eBay. Also, in another twist, budget-priced audio/video components maker Monoprice not only offers a line of affordable vacuum tube audio products, including amplifiers, preamps, and headphone amps, but some also incorporate wireless Bluetooth. In other words, you can enjoy both the convenience of direct wireless Bluetooth streaming and that warm vacuum tube sound. In addition, even though vacuum tubes are associated with high-end audio, there are some inexpensive vacuum tube audio products also available from China-based sources. The Vacuum Tube has also made its way into the home theater environment, with products, such as the Jolida Fusion Vacuum Tube CD Transport, OPPO BDP-105 Vacuum Tube Modified Blu-ray Disc player, the Rockford Fosgate FAP-V1 5.1 Channel/Dolby Pro-Logic II Preamp or the Decware Ultra Multi-channel preamp. Add a multi-channel hybrid vacuum tube power amplifier (an amplifier that combines both vacuum tubes and solid-state design), such as the Butler Audio Model 5150, and you can have a vacuum tube based home theater audio system. Vacuum tube audio for home theater hasn't gone unnoticed by big player Samsung, which briefly offered a line of vacuum products, including an Audio Dock and Home Theater-in-a-Box Systems. These products are no longer being produced, but if you find one used, they are worth checking out. In addition to home audio and home theater vacuum tube-based products, other innovative applications for vacuum tubes in audio also include vacuum tube headphone amplifiers from companies such as Apex Audio, Moon Audio, and Vincent Audio. Also, for those who can't leave their vacuum tubes at home, companies such as Butler Audio (Tube Driver) and Milbert Amplifiers produce a line of unique vacuum tube car audio products. Even with all the emphasis on digital technology in the new century, the vacuum tube has made a big comeback with audio aficionados (or did it really ever leave?). Although there is a dedicated fan base that feels that the warm, glowing sound of a good vacuum tube amplifier has no equal, the only to way for know if you should take the plunge, is to seek out a demonstration of vacuum audio products. You can connect the RCA analog audio outputs of a CD player, DVD player, TV, or other source devices that provide that of connection to a vacuum preamp or amp and experience the sound of vacuum tube audio. Supported by continuing loyalty from the audiophile community and audiophile press, in addition to increased profits for dedicated manufacturers and brands, as well as Russian, Eastern European, and Chinese suppliers the vacuum tube's continued success might just be insured, despite the digital revolution. The current resurgence of the vinyl record and turntable market proves that old and analog doesn't mean obsolete. Should you decide to embark on a quest to acquire high-end vacuum tube audio gear, one example of a true classic that has stood the test of time, is the Dynaco Stereo-70 vacuum tube power amp. Originally introduced in the late 1950s, its design has changed somewhat through the years and was discontinued for a time, but has been revived with a new design, commanding a much higher price now than in the '70s. Check out a review of one version of the Dynaco Stereo-70 by Stereophile Magazine. There are several online and print publications, including Audiophilia, The Absolute Sound, Superior Audio, and Stereophile Magazine that regularly report on and review vacuum tube audio trends and products.